This year I set a fairly vague New Year’s resolution to live a little healthier. I tried to set small goals within this resolution that I knew I could accomplish while not overwhelming myself to the point of giving up. Two months in and I’m meeting and exceeding my healthy living goals. My goals revolve around creating life-long habits that I can sustain that will help me be happier and stronger for many more years. I know many moms with young kids, like myself, struggle to make healthy choices, it’s one of my biggest barriers. 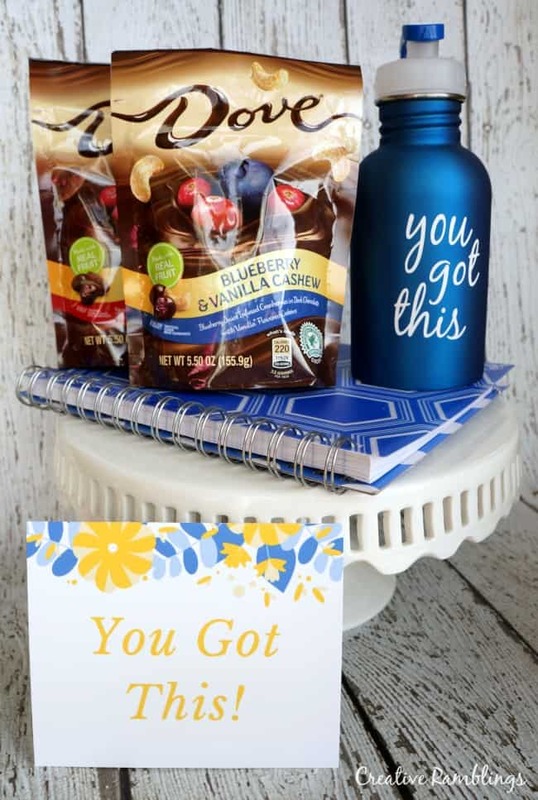 I thought it would be nice to create a simple motivational gift basket for a friend who I know wants to live a littler healthier. 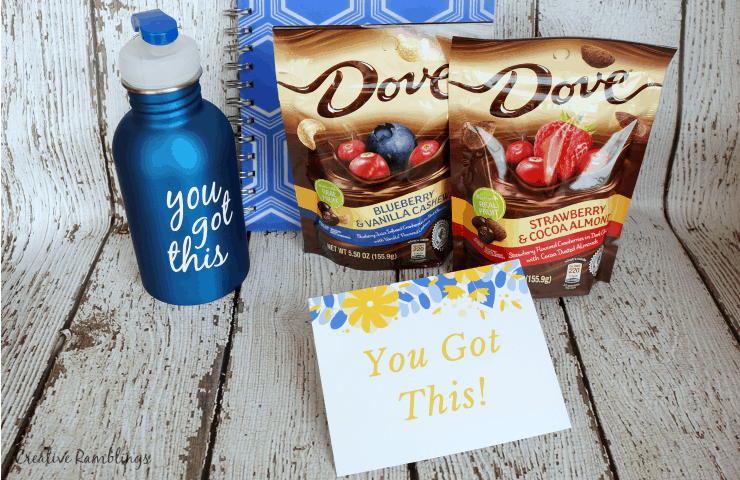 This silhouette water bottle and sweet reward gift basket with DOVE® Chocolate Fruit & Nut are sure to lift her spirits and help her stay on track. Living a little healthier means that I can make good choices about moving and eating without giving up everything indulgent in life. I choose to workout while my kids are in school, I also choose to fill up on fruits and veggies with meals and drink a few extra cups of water each day. I do no choose to give up a bit of chocolate now and then or a little TV time at night laying on the couch. These things make me happy and I know, in moderation, they won’t hinder my healthy choices. 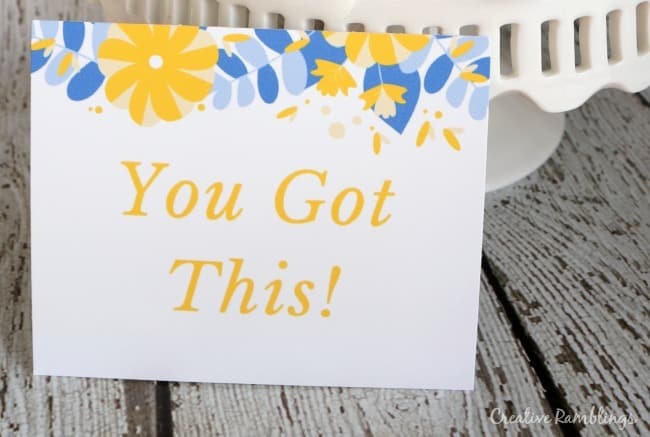 I also added a printable card that you can download and use in a motivational gift basket of your own. 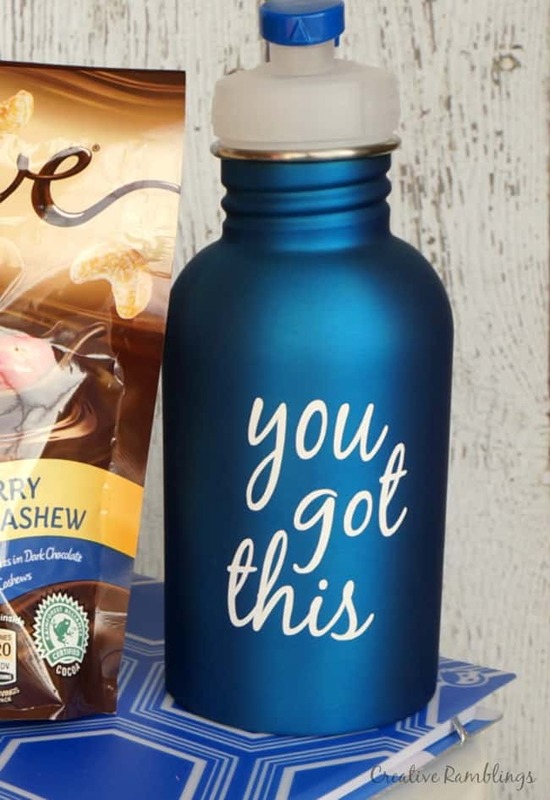 My favorite part of this gift basket is the personalized water bottle I created with my Silhouette. 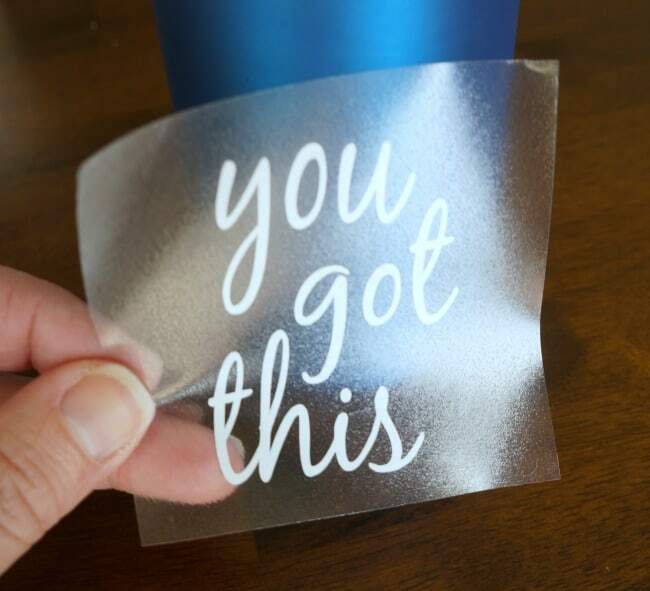 A little reminder to a friend that she can and will reach her goals. I started by designing the words You Got This in my Silhouette software. The Silhouette is incredibly easy to use and by far my favorite crafting tool. If you are a crafter I highly recommend looking into this machine. 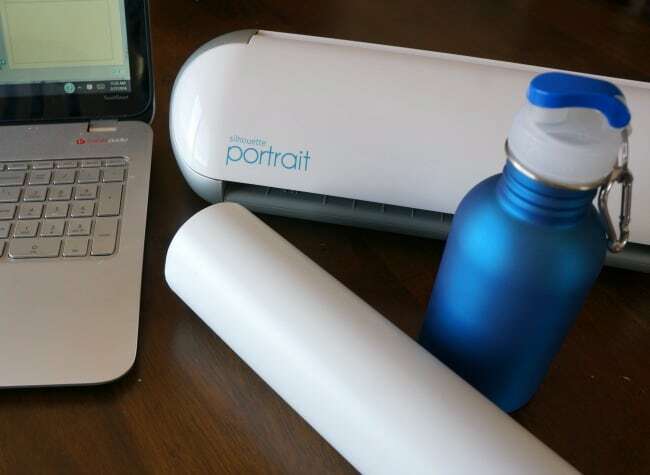 Once the words were designed and sized correctly for my water bottle, I loaded white vinyl into my machine and cut out the words. From here I transferred the vinyl to my water bottle using transfer paper (or clear adhesive shelf liner), then pressed firmly to permanently adhere it. This vinyl is permanent and will hold up to washing and lots of use. 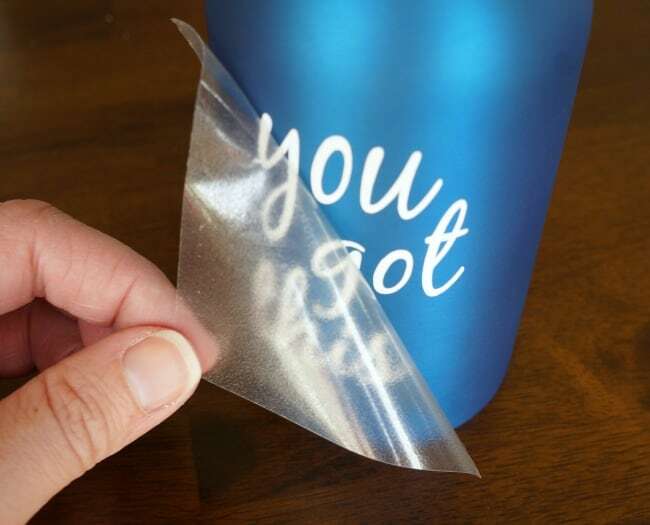 Another option for creating a personalized water bottle is to stencil words onto vinyl then cut them with a craft knife. You will get the same durable result, it will just take a bit more work to achieve it. Here is what I included in this sweet reward gift basket. You can download and print this card below. I encourage you to think about who you know that could use a little motivation and create a simple gift basket for her. 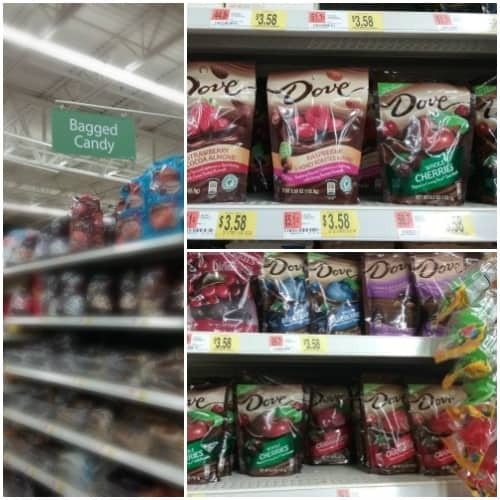 DOVE® Chocolate Fruit & Nut is available at Walmart in a special display. Be sure to look for all the varieties this month and take advantage of this great coupon while you shop. These are an amazing treat and just what I’m looking for when I want some better-for-you indulgence. 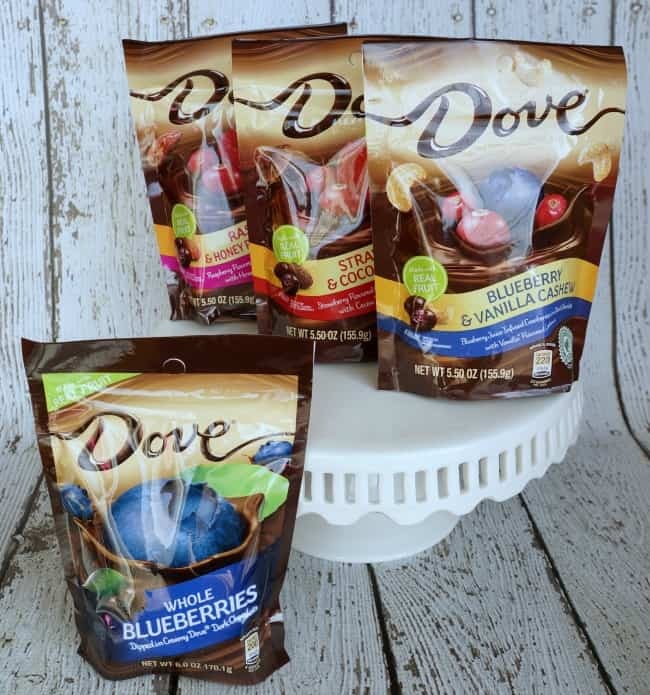 I’d love to know what you would include, especially what new DOVE® Chocolate Fruit & Nut product you would add to your basket?